Background: Meniscus plays an important role in weight-bearing and energy absorption. Moreover, its function is optimal to maintain joint stability and congruous. Treatments for meniscus damage or meniscus tear include open or arthroscopic repair and meniscectomy. One of the most important factors that influence patients' recovery outcome is restoration technique. The purpose of this study was to compare the strength of recently new method of meniscus repair, submeniscal horizontal sutures, and single vertical loop suturing techniques in meniscus repair. 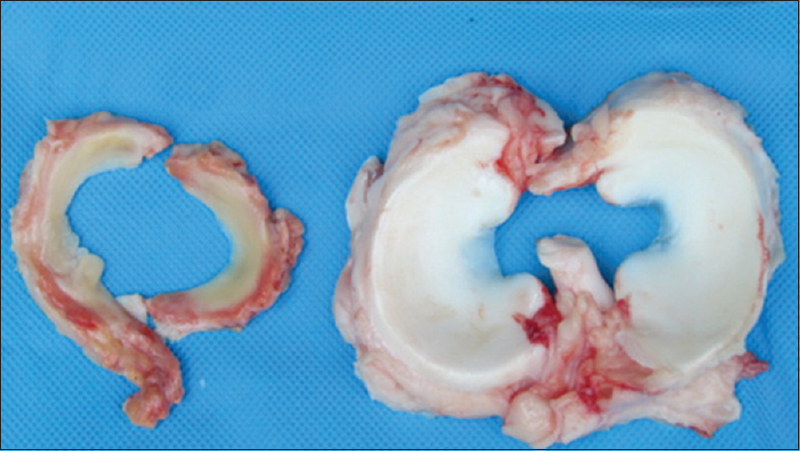 Materials and Methods: An experimental study was conducted to study 12 ruptured medial meniscuses of bulls, which were divided into two groups of six meniscuses equally. In this study, submeniscal horizontal and vertical loop suturing techniques were compared based on their resistance to tensile forces and the stability of repaired gaps. Results: In this study, submeniscal horizontal and vertical loop knots were 104.3 ± 12.5 N and 110.7 ± 16.4 N, respectively. No significant difference was found between the two groups. To measure the stability of the gap, 95.4 ± 8.7 N tensile force was applied to submeniscal and 124.6 ± 11.7 N to vertical loop techniques. There was significantly different in gap stability between horizontal and vertical loop techniques in meniscal repair (P = 0.02). Conclusion: The results of this study indicate that knot resistance in submeniscal horizontal is similar to vertical loop resistance. The stability of the restored gap in vertical loop technique is more than submeniscal horizontal techniques. 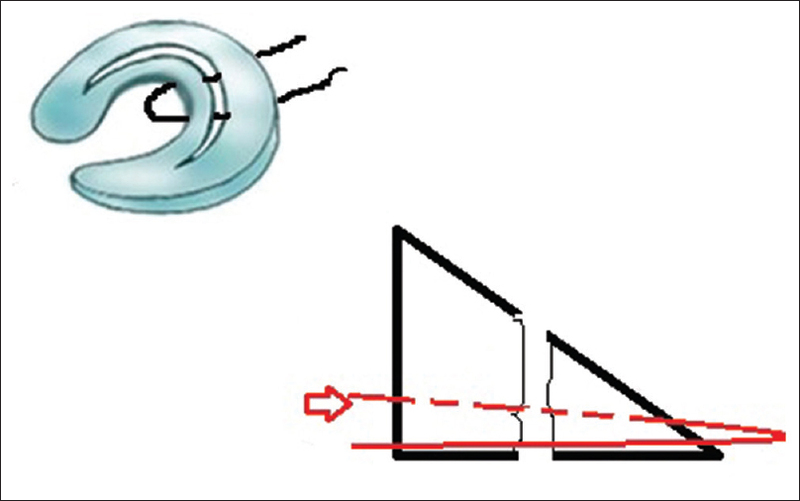 Vertical loop causes greater stability against tensile force. Each meniscus consists of crescent-shaped fibrocartilage that lies between the femoral condyles and the tibial plateau. The meniscal diameter is about 35 mm and it is fixed to the joint capsule by its peripheral margin, which has a length of 110 mm. Anterior horn and posterior horn are firmly attached to the bone through ligamentous connections. According to the statistics, meniscal tear occurs to 60–70 individuals/100,000, which makes it common among people. Meniscal tear in men occurs four times more than women. Meniscal pathology at younger age and acute trauma and degenerative changes in older ages are the causing factors of meniscal tear. One-third of meniscal tear cases are related to or concurrent with cruciate ligament tear. The peak age for men is from 21 to 30 years and for women from 11 to 30 years. Meniscuses play an important role in the function of the meniscus of the knee. Based on the longitudinal studies, knees with missing meniscus are susceptible to arthritis changes and early osteoarthritis. The meniscal function in weight-bearing, energy absorption, joint stability, and joint congruency is crucial. Treatment methods in cases of damage and meniscal tear include total or partial meniscectomy, open meniscus repair, or arthroscopic surgery with inside-out, inside-in, and all-inside methods., Different repair techniques are introduced, and suture repair techniques caused to superior biomechanical stability. Regarding its strength, vertical sutures are commonly considered the gold standard. According to different models, the strength of vertical sutures was found to be in a range from about 60 N to more than 200 N., Horizontal sutures lie in between the circumferential fiber bundles and yield a lower failure load because they are pulled through those fibers as they are loaded. Today, submeniscal horizontal repair is considered. Today submeniscal horizontal suture repair technique has been considered, it is alternative method in meniscus repair. Until now, this technique has not been compared and it is a biomechanical study. In this study, we aimed to compare the strength and stability of two meniscus techniques including submeniscal horizontal and vertical loops. In an experimental study, a sample consisted of 12 medial meniscuses of 14–16-month-old Holstein bulls was being investigated. The bulls had been growing up in the same farm in a similar situation. Their meniscus was removed for the experiment within 24–48 h after slaughter. All the meniscuses were slotted 3 cm longitudinally with 4 ml away from the edge. The yarn that was used for all the cases in the current study was from the same size and same type. No. 1 polydioxanone (PDS; Ethicon, Somerville, NJ) and a 21-G needle in each technique were used. A tensiometer was used to measure the elasticity and resistance of the knots, and the applied force was measured in Newton. Stability of the gap was considered visually and deformation. [Figure 1] shows how to measure the resistance with tensiometer and [Figure 2] shows cows' meniscus in comparison with human meniscus. In submeniscal horizontal techniques, suture was passed through the meniscus body horizontally and across the tear and exited from the undersurface of the meniscus [Figure 3]. The suture was advanced until the end of the suture was seen within the joint. The free end of the suture was pulled out through the anteromedial portal using a grasp. Anterior to the entry point, a second cannula threaded with a nylon 2-0 suture loop was passed through the same incision and again exited through the inferior surface of the meniscus. Outside the knee joint, the free PDS suture was passed through the suture loop. Pulling on the suture loop from its entry point drew the free suture back into the joint and out of the skin. The two free ends of the PDS suture were then tied with 5–6 simple knots. In single vertical loop techniques similar to submeniscal horizontal, the PDS suture was used. The suture was passed across the tear and vertically stretched out [Figure 4]. After attaching the knobs, we connected the tensiometer and gradually applied force. For statistical analysis between the two groups, used Mann–Whitney U statistical methods for nonparametric. The SPSS software (Statistical Package for the Social Sciences, version 17.0, SPSS Inc, Chicago, Ill, USA) was used for data analyses and a P value less than. 05 was considered significant. 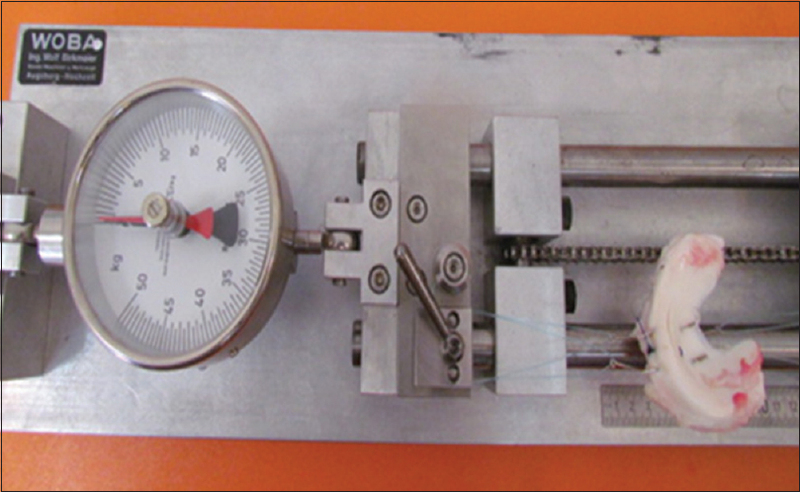 In this study, the submeniscal horizontal and vertical loop stitches had the same resistance to tensile forces, and no significant difference was observed between these two kinds of suturing. However, the stability of restored gap was greater under tensile force in vertical loop suturing than in submeniscal horizontal and statistically significant difference was observed in the field [Table 1]. Meniscal tear usually occurs due to a combination of mechanical forces or without previous meniscus injuries such as degeneration., Rupture occurs less traumatic if no injuries have already occurred. Several therapeutic procedures have been used for meniscal tear such as meniscectomy and various methods of repairing (3 and 4). Nowadays, specialist's opinions focus on repairmen of the damaged meniscus. The full-length tear is the most common types of meniscal tears that need restoration. Recovery success depends on many factors such as the techniques that are used in repairing and surgery procedures. Meniscus repair could be done using two different techniques including open or arthroscopic methods such as inside-out, outside-in, and the all-inside types. Outside-in and inside-out methods are performed by a simple incision. All-inside methods include different options and multiple nodes and multiple arthroscopic fixtures and various fixation devices. Besides restoration methods, suturing techniques for fixing the torn area play an important role in recovery outcome and success. In the past few years, due to the progresses made in science and also amplification of our knowledge, numerous ways of suturing of meniscus have been invented. There is uncertainty in the current literature on the use of vertical and horizontal suturing techniques. Many authors believe that the tension forces have no impact on the horizontal and vertical suturing techniques, and some authors believe that horizontal suturing techniques are less efficient compared to vertical suturing techniques, and rupture in vertical technique is 25% less than the horizontal type. A technical problem during meniscal repair in horizontal techniques is placing the sutures in the far posterior region of the meniscus. Submeniscal horizontal suture is a suitable technique to resolve this problem and reach this part of the menisci without any additional incisions. Another issue concerning meniscal repair is the possible abrasion of joint cartilage and synovium by the repair materials. Parts of the implants that surmount the surface of the meniscus can wear down the cartilage in the contact zones and cause chronic synovitis., The suture materials placed over the meniscus may abrade the cartilage of the femoral condyles during weight-bearing and range of motion. The rationale for using submeniscal sutures is to prevent this potential hazard. In the clinical study by Navali and Aslani, submeniscal horizontal out-in repair technique of meniscus tear in 103 patients had succeeded. This technique is cheap, safe, and has the advantage of avoiding chondral abrasion caused by solid implants and suture materials placed over the meniscus. According to an experiment by Boenisch et al., additional force was needed to suture failure for the sutures done with a vertical technique (113.9 N) in comparison with the horizontal techniques (75.1 N) using PDS-0 yarns. In addition, Post et al. showed in their study on animal models that a 146.3 N force was necessary for suture failure in vertical techniques while in horizontal type a force as strong as 73.8 N was needed. The kind of suture that was used was similar to a previous study (PDS type) and there was no difference in the fabric. In this study, for further investigation, Ethibond yarns (2-0 Ethibond) have also been used in addition to the PDS and the same result was obtained; stability of the suture done in a vertical way was greater than horizontal ones. According to the study conducted by Fantasia et al. in 2012 in a laboratory environment on the stencil power of the meniscal suturing, mulberry techniques have high tensile strength in comparison to the horizontal method, and tensile strength of sutures done in mulberry technique was 30 N more. In contrast to the findings of the above experiments, Kocabey et al. 's study indicates that the average force required to suture that is done with a vertical technique to fail is 145.9 N and in oblique technique is 171.9 N, which are significantly different. Based on the findings of our study, vertical loop suturing resistance to tearing is the same and no significant differences have been observed in this matter. The interesting point in our results is the stability of the repaired gap in two different techniques of repairing. So that, the sutures that were done with the single vertical loop technique were more persistent in comparison with those submeniscal horizontal techniques. However in previous studies, vertical loop techniques have more stability against tension and their resistance was greater in comparison with horizontal nodes; according to our study, the aim was to examine both vertical loop and submeniscal horizontal loop techniques which have not been done before and hence our study is unique in this respect. The high resistance of vertical suture was mentioned in two studies conducted by Boenisch et al. and Post et al.,, and the amount of tensile force needed to fail this vertical sutures was reported to be 150 N which was consistent with the results in our study of vertical sutures. However, vertical loop sutures seemed to have higher persistence since it can tolerate 30 N additional forces and kept their stability under a force up to 180 N. Still, the required force for failing the two types of suture was the same. A similar result was found in a study conducted by Rimmer et al. on the evaluation of three methods of single horizontal arthroscopic loop knots, double vertical loops, and single vertical loop. The average horizontal force needed for suture failure was 29.3 N, and while this force was greater for a double vertical loop was much more. This difference was statistically significant. In the clinical study by Navali and Aslani, submeniscal horizontal out-in repair technique of meniscus in 103 patients had succeeded. This technique is cheap, safe, and has the advantage of avoiding chondral abrasion caused by solid implants and suture materials placed over the meniscus. In addition, the shape of meniscus repair may affect results of improvement. The three repair methods – the hashtag, crosstag, and cross-suture techniques – were evaluated by Stender et al. in radial tears of meniscus. Based of Stender et al. 's study, two novel repair techniques – hashtag and crosstag – that did not demonstrate superiority in terms of load to failure or stiffness, but both repairs were statistically superior to the cross-suture repair in terms of displacement after cyclic loading. In contrary to this, in our study, the cyclic loading force has not been studied in the repair of the meniscus tear, which is one of the weaknesses. Tissue healing and the lost structural integrity to recover in human dependent more factors. Our experiment in two methods of meniscal repair was done in meniscus of bulls, which is essentially (diameter and stiffness) different from humans. For this reason, there may be differences in the amount of tensile strength involved. In this study, the tensile force was applied only to the horizontal plane. In the human's knee and clinical setting, different forces are brought to the meniscus vertically, horizontally, and cyclic loading force. The results of this study indicate that knot resistance in submeniscal horizontal is similar to vertical loop. The stability of the restored gap in vertical loop technique is more than submeniscal horizontal techniques. Vertical loop causes greater stability against tensile force. This study was financially supported by Urmia University of Medical Sciences. Maffulli N, Longo UG, Campi S, Denaro V. Meniscal tears. Open Access J Sports Med 2010;1:45-54. Konan S, Haddad FS. Outcomes of meniscal preservation using all-inside meniscus repair devices. Clin Orthop Relat Res 2010;468:1209-13. Adams SB Jr., Peretti GM, Weinand C, Randolph MA, Gill TJ. Meniscal repair: Current strategies and the future of tissue engineering. Ortho J Harv Med Sch 2003;5:138-41. Barber FA, Herbert MA, Richards DP. Load to failure testing of new meniscal repair devices. Arthroscopy 2004;20:45-50. Dervin GF, Downing KJ, Keene GC, McBride DG. Failure strengths of suture versus biodegradable arrow for meniscal repair: An in vitro study. Arthroscopy 1997;13:296-300. Rankin CC, Lintner DM, Noble PC, Paravic V, Greer E. A biomechanical analysis of meniscal repair techniques. Am J Sports Med 2002;30:492-7. Rimmer MG, Nawana NS, Keene GC, Pearcy MJ. Failure strengths of different meniscal suturing techniques. Arthroscopy 1995;11:146-50. Navali AM, Aslani H. Clinical results of meniscal repair using submeniscal horizontal sutures. Arch Bone Jt Surg 2015;3:179-83. Rockborn P, Messner K. Long-term results of meniscus repair and meniscectomy: A 13-year functional and radiographic follow-up study. Knee Surg Sports Traumatol Arthrosc 2000;8:2-10. Song EK, Lee KB. Biomechanical test comparing the load to failure of the biodegradable meniscus arrow versus meniscal suture. Arthroscopy 1999;15:726-32. Sarimo J, Rantanen J, Tarvainen T, Härkönen M, Orava S. Evaluation of the second-generation meniscus arrow in the fixation of bucket-handle tears in the vascular area of the meniscus. A prospective study of 20 patients with a mean follow-up of 26 months. Knee Surg Sports Traumatol Arthrosc 2005;13:614-8. Kelly JD 4th, Ebrahimpour P. Chondral injury and synovitis after arthroscopic meniscal repair using an outside-in mulberry knot suture technique. Arthroscopy 2004;20:e49-52. Kotsovolos ES, Hantes ME, Mastrokalos DS, Lorbach O, Paessler HH. Results of all-inside meniscal repair with the FasT-fix meniscal repair system. Arthroscopy 2006;22:3-9. Boenisch UW, Faber KJ, Ciarelli M, Steadman JR, Arnoczky SP. Pull-out strength and stiffness of meniscal repair using absorbable arrows or ti-cron vertical and horizontal loop sutures. Am J Sports Med 1999;27:626-31. Post WR, Akers SR, Kish V. Load to failure of common meniscal repair techniques: Effects of suture technique and suture material. Arthroscopy 1997;13:731-6. Fantasia F, Potalivo G, Placella G, Fantasia L, Cerulli G. Meniscal sutures: Biomechanical study of “mulberry” and horizontal loop techniques. J Orthop Traumatol 2012;13:13-9. Kocabey Y, Taser O, Nyland J, Doral MN, Demirhan M, Caborn DN, et al. Pullout strength of meniscal repair after cyclic loading: Comparison of vertical, horizontal, and oblique suture techniques. Knee Surg Sports Traumatol Arthrosc 2006;14:998-1003. Stender ZC, Cracchiolo AM, Walsh MP, Patterson DP, Wilusz MJ, Lemos SE. Radial tears of the lateral meniscus-two novel repair techniques: A biomechanical study. Orthop J Sports Med 2018;6:2325967118768086.